IOLAN SCG18 R-LAWM Console Server: 16 x RS232 RJ45 interfaces with software configurable Cisco pinouts, 2 x USB 3.0 (Type-A) Console Management Ports, Front Panel Display and Keyboard, 2 x auto-sensing 10/100/1000 Ethernet Combo Ports (RJ45 or SFP), Cellular WWAN capability based on 4G LTE (America including AT&T and Verizon) with fallback networks (HSPA+, UMTS, EDGE and GPRS), Wireless LAN (WiFi) client IEEE 802.11 a, b, g, n @ 2.4Ghz/5Ghz,integrated RJ45 V.92 modem, Mico SD Card Slot, Expanadable using IOLAN G16 RS232 Card and IOLAN G16 USB Card, Micro USB and RS232 RJ45 Console Admin Ports, advanced data encryption, user authentication and event management security features included, IPv6, COM port redirector, 15kv ESD, Dual AC power adapter included. 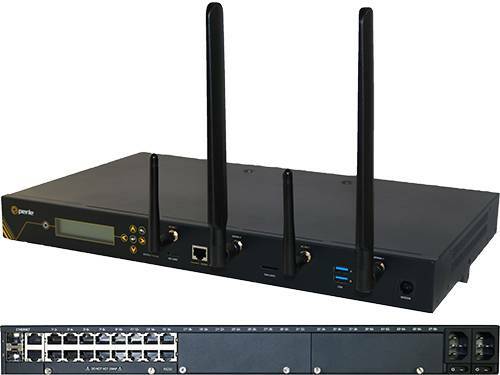 The Perle IOLAN SCG LWM Console Servers provide data center managers with secure remote console management of devices with an RS232 RJ45 or USB console port, such as routers, switches, firewalls, servers PBXs, network storage equipment and security appliances, through an IP network, WiFi network, integrated V.92 modem dial-up, or over a 4G LTE Cellular network. The modular design of the IOAN SCG allows the user to swap, upgrade and scale to any ?mix-and-match? combination of 16-port USB 3.0 or RS-232 RJ45 interface module cards. For complete product details and technical specifications, please visit our IOLAN SCG LWM Console Server Product Page.